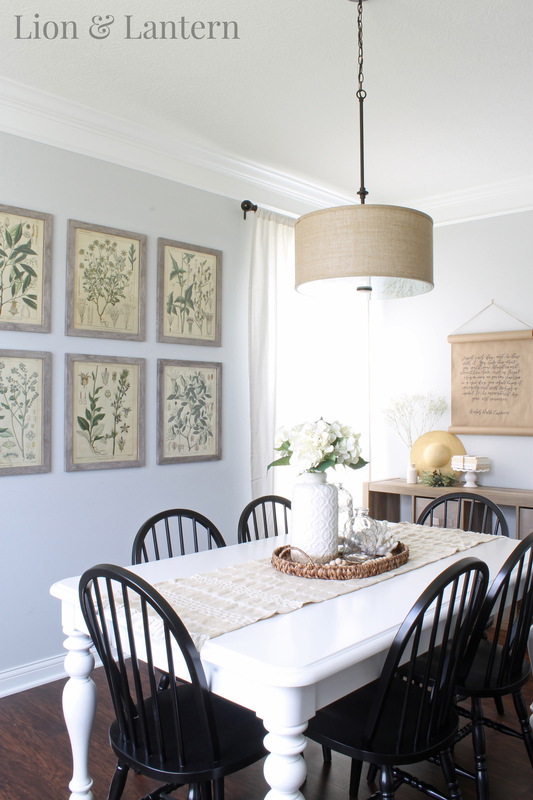 Coastal touches like natural fibers, white coral, hydrangeas, and botanical prints make a simple dining room feel airy and fresh for summertime! Hello again friends! Thank you so much for dropping by; I hope this post finds you well. 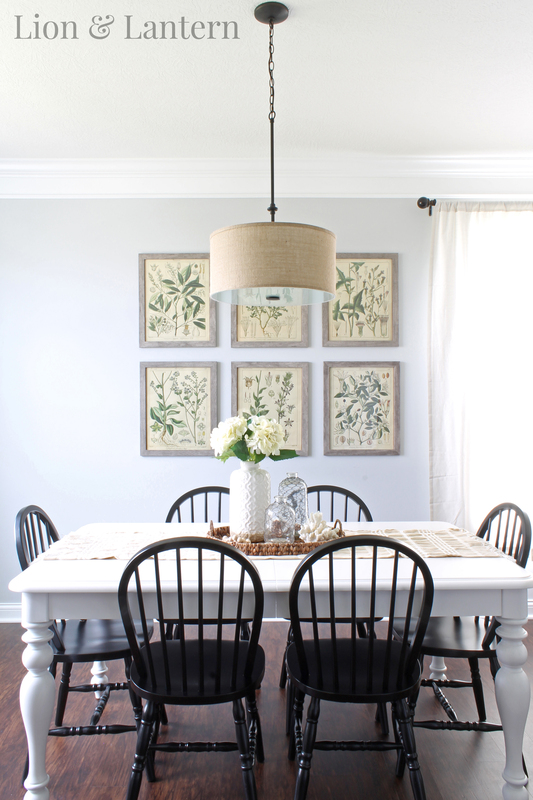 Today I thought I would share our dining room with you. It is still very much a work in progress! Since fall is drawing near, however, I thought I should share this space decked out for summer before I start incorporating cozy, autumnal touches. This post contains affiliate links. To read my full disclosure policy, click here. 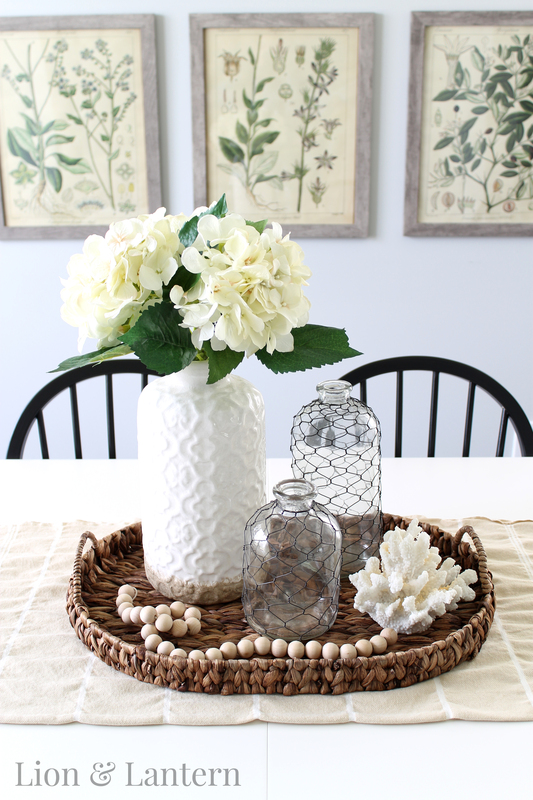 This natural woven tray anchors the coastal theme of the room. Hydrangeas are one of my favorite flowers, and these cream ones add a subtle, feminine touch. 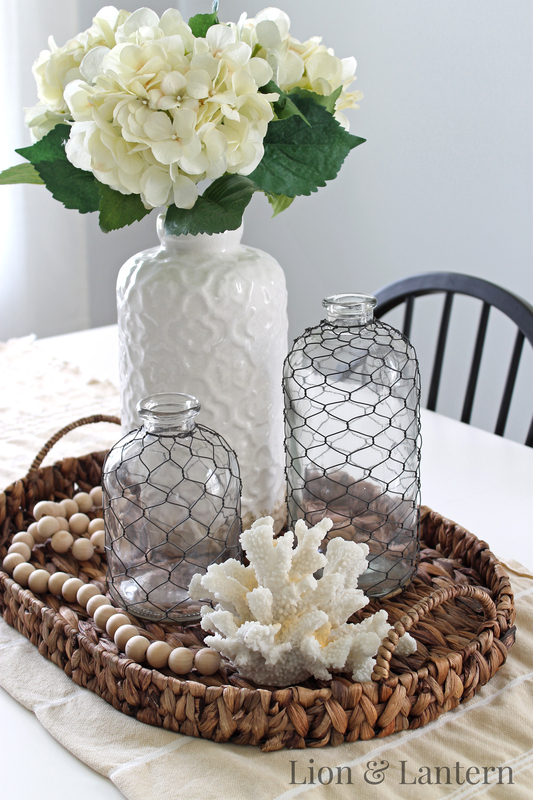 I found the vase, chicken wire bottles, coral, tray, and flowers all at Hobby Lobby (on sale, of course!). I’ve loved the look of wood bead garlands for a while, and finally realized I could make my own! I used these inexpensive beads from Amazon and string that I already had at home. (Update: DIY wood bead garland tutorial here!). 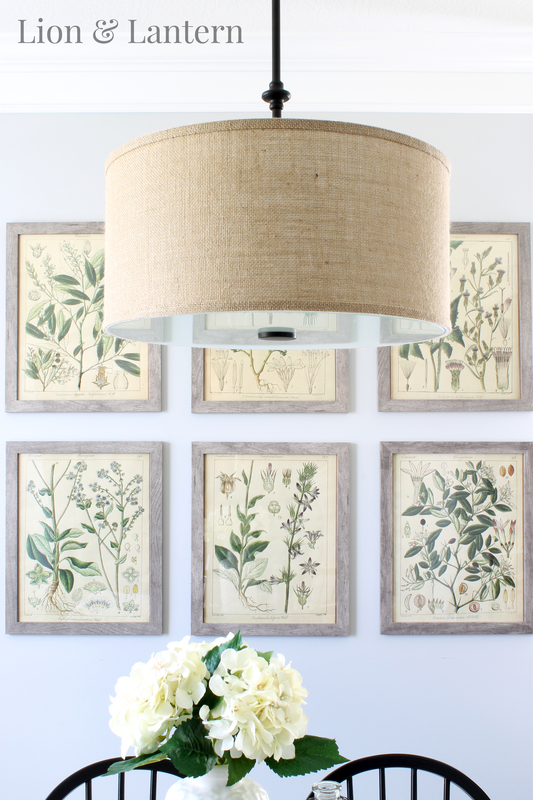 These gorgeous botany prints are public domain images that Lauren at Bless’er House discovered! 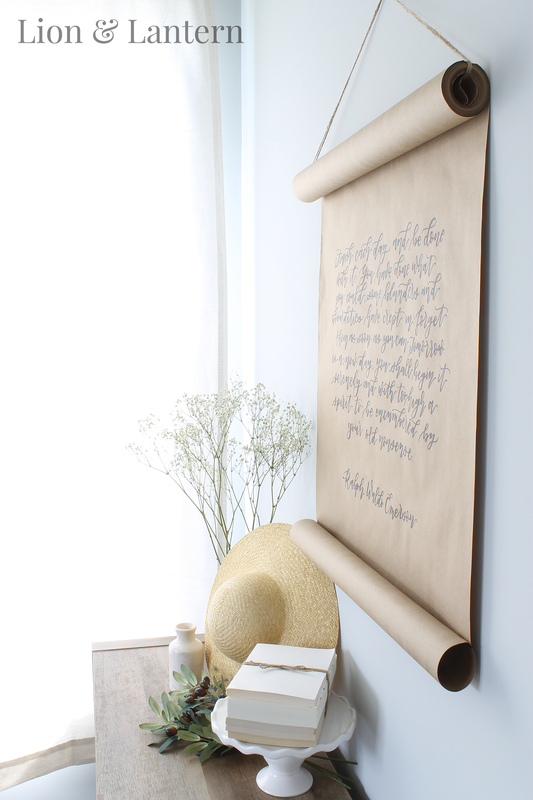 She has a wonderful tutorial up on her blog where she explains how to print, frame, and hang them in your home. I used the same frames she lists, except that I ordered them in gray instead of honey. In terms of layout, our dining room is directly on the left when you walk through the front door. It also doubles as a playroom for Bug, so the cube organizer against the wall helps coral toys and books (and please note, I removed a LOT of toys from this room to shoot photos!). We enjoy having a separate dining room apart from our breakfast nook, even if it seems a little impractical with all of the toys. There is something special about adjourning to a separate room to have a meal; it allows you to escape the everyday hustle and bustle of the kitchen and focus a bit more on good food and friends. Our dining room sat empty for many months after we moved in this January, and I didn’t want to spend a lot on decor right away. 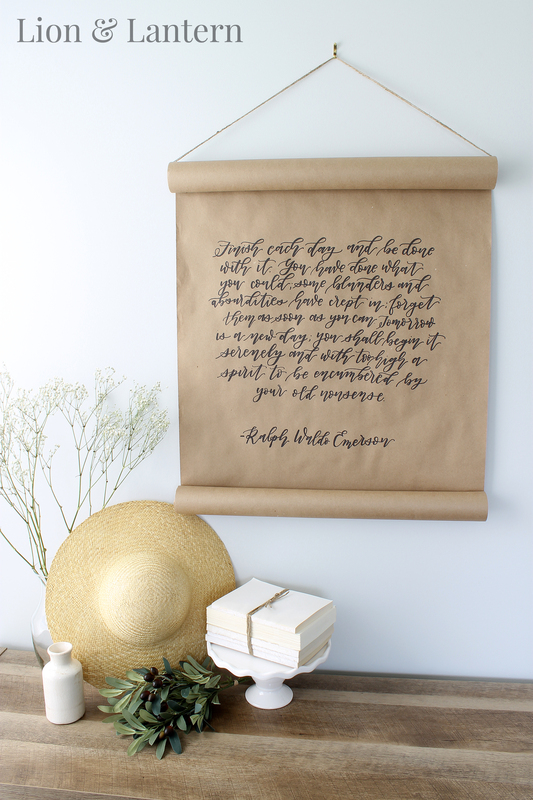 I made this quote scroll myself using a Kraft paper roll, twine, and a Sharpie. I’m planning to do a tutorial on it soon, so stayed tuned if you are interested in creating your own quote art for fall or the holidays! This straw hat has a special meaning to me because it was crafted in Colonial Williamsburg, a place my family loved to visit when I was growing up. My dad especially loves history and made sure we became acquainted with as many battlefields and historical manors that we could travel to! One year in Colonial Williamsburg my sister and I bought matching straw hats, and I’m so glad we saved them. Now we both have them on display in our homes as a reminder of those special trips. Since we usually stopped in Colonial Williamsburg on our way to the beach, my memories of it are interwoven with those of salty breeze and sandy toes. 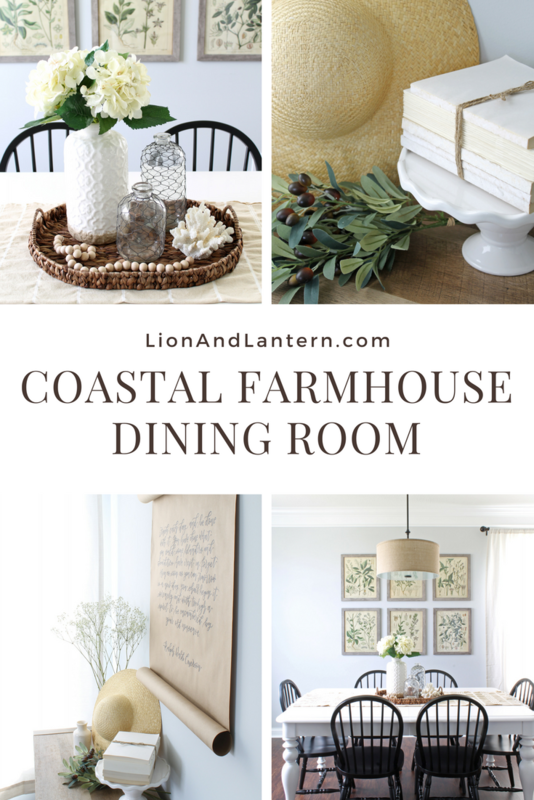 So, my handmade straw hat seems like a perfect fit for our coastal dining room! 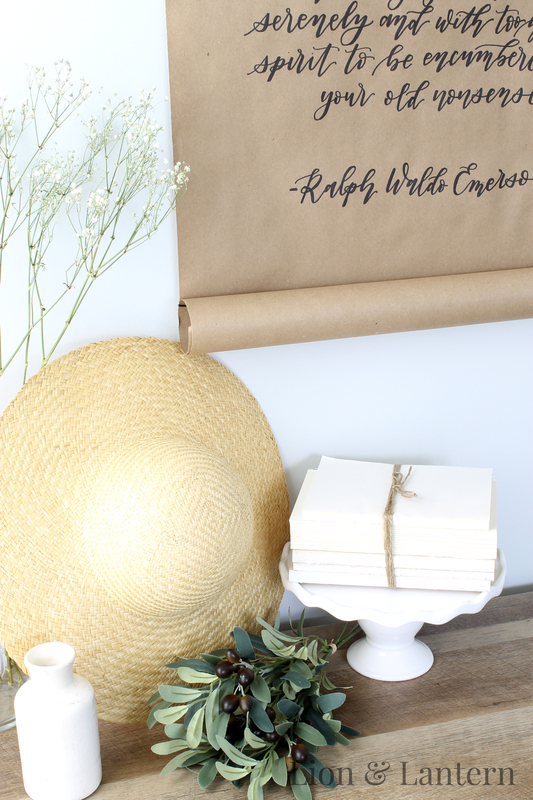 I finished off this vignette with a few olive branches and another DIY book bundle (if you haven’t noticed, I’ve been using them everywhere! Tutorial on the way!). Hi! I love your drum light fixture! Where is it from?